Heat the olive oil over medium heat in a saucepan and sauté the onion and garlic for 3 minutes. Add the sun-dried tomatoes, vegetable stock, wine and lemon juice and bring to a boil. Stir in the quinoa and salt. Reduce heat, and simmer covered about 20 minutes. Add the broccoli on top and simmer an additional 5 to 6 minutes. Remove from heat, toss gently until combined. Add ground pepper and additional salt, if desired, to taste. Plus 36 othersFrom around the world! 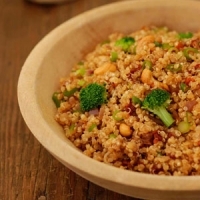 I have been looking for a great quinoa recipe to try and this looks awesome! This sounds awesome! I will have to try it. Beautiful recipe ~ thanks for a great post! That sounds fantastic - will have to forward it on to my vegan sis and quinoa-loving daughter!